I am proud to be an American and wish many congratulations to President Obama! Just after noon, Obama stepped forward on the front West Lawn of the Capitol to lay his left hand on the same Bible that President Abramham Lincoln used in his first inauguration in 1861. The 35-word oath of office has been uttered by every president since George Washington. 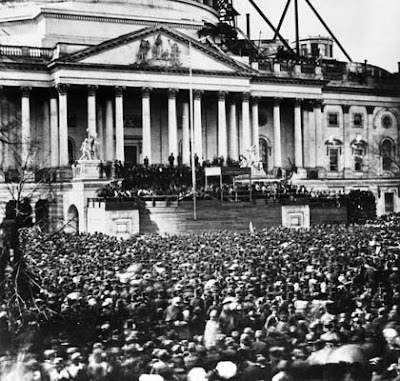 This is a picture of Lincolns inauguration. yes, it was a wonderful moment! Hi Tami! I am consolidating all my comments in this ONE... your posts are all such fun. Never heard of National Girlfirends Week, but glad to include you in my world. Today was amazing, wasn't it? So hopeful and proud! Congratulations President Obama!! PS Tami.... just noticed you have initiated blog owner approval for comments to your blog....curious. Can you share with us about the change? Ina, I had some man sign up for my blog and when I looked at his blog I didn't think it was appropriate for what I believe in and other morals I have. I decided I want to check before anything was posted. No offense to those who have been posting for awhile! !